My father & I have been experimenting with low-tech wind power. Dad said we needed a name for our little enterprise. ReCyclone seems to fit. 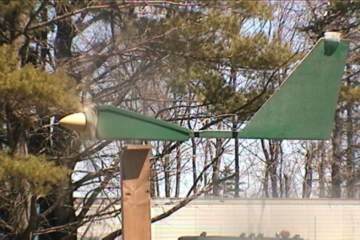 Most of the materials in our wind machines came from the junk pile. (or the trash can... see below). 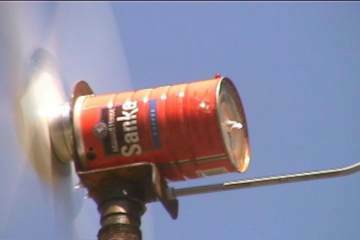 Not wanting to waste a perfectly good Sanka can, my father hooked a 2 blade prop to a small dc motor via a junked vcr playhead/bearing. Add a pole and tail, 6 L.E.D. 's and voilà! ReCyclone Power! Mine is on the right. It features 2 vcr playhead/bearings, some light plywood salvaged from a pallet and a few L.E.D. 's in the tail to prove that it is generating a bit of power. (Looks a lot more impressive at night, see below.) 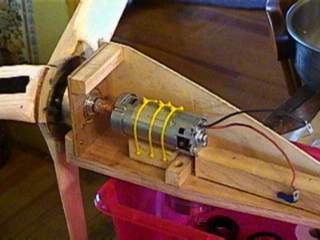 The generator is a 24 volt dc motor from a battery powered lift. My first bearing idea was a failure; a small motor/bearing assembly from a Western Digital hard drive. I attached the prop to the chrome platters but the little motor wasn't up to the task.... it broke before it ever went into service. I jury-rigged the platters onto the vcr playhead instead. It took me a while browsing different web pages to figure out that the prop was flat on the front and rounded in the back. 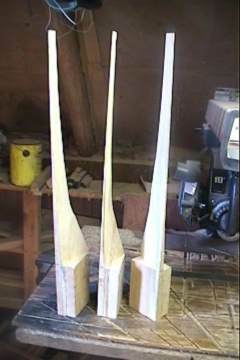 Armed with this information and not much else, I carved the blades according to my own idea of what should work. I haven't completely forgotten what I learned about airfoil shape back in my RC Flying days. In hindsight, I think the pitch is too sharp, letting a lot more wind by per rev. than it should. I purchased a Blade Designer program from Windstuffow.com and am making a new set. I will set up another mill with the same generator hooked up to the new blades and compare performance. The small dc motors we have used aren't ideal in many ways, mainly because they have to turn fairly fast to produce power. Using a gear-up ratio scheme detracts from reliability. 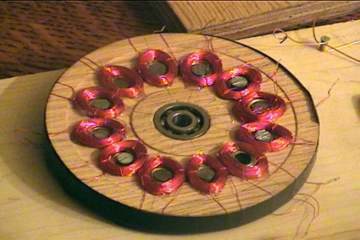 Now I see the advantages of a homemade alternator/generator using permanent magnets. After seeing several different methods of building permanent magnet alternators, I decided to build a test rig. A while back I had wanted to build a pulley system to illustrate for my son and nephews the concept of using different ratio size pulleys to change the speed and torque output of a motor. I figured this would be the perfect way to also try different coil windings with a P.M.G. I know better than think I'm going to discover anything new, but actually building the armature and coils is a really fun learning experience. For instance, I was a bit foggy on the arrangement of coils and magnets. I didn't know if just the polarity of the magnets alternated or the coils as well. From my test rig I learned that if the coils don't alternate polarity as well as the magnets, the voltage from one coil will cancel out the previous one. Also, it's the change in magnetic field (north to south to north to south etc.) that causes current flow, if the magnets didn't alternate you would get one brief charge when they started to spin and that's it. 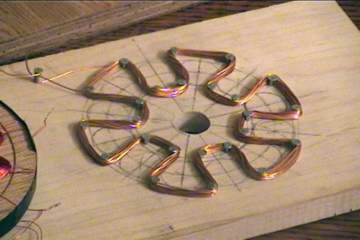 The first stator I made had 12 coils; each coil was 115 wraps of 30 ga. wire. I bought the wire in a 3 spool pack of magnet wire from Radio Shack. The wheel pictured here was really supposed to be an armature not a stator, the bearing does nothing but align the coils with the magnets. I tacked the coils on the stator and gave it a test spin. 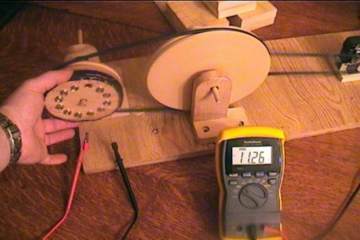 At the speed my test rig is set for, the alternator put out about 10 volts. Somewhere I read that putting metal in the winding (or behind) would increase the power output in the coils. I hacked in these adjustable metal rods to increase or decrease the attraction to the magnets. When they are very close to the magnets the wheel is noticeably harder to turn. This effect is called "cogging". 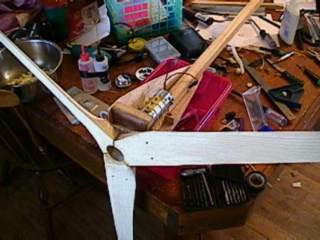 My thinking was that at low speed the rods could be backed away to allow the armature/windmill. 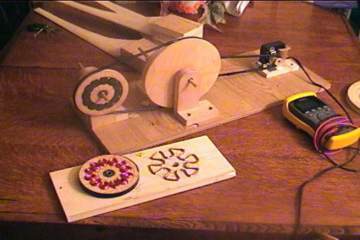 to start spinning easier, then once in motion the rods could be moved closer to pull more flux out of the magnets. I haven't really reached any conclusions about my metal rod scheme yet. I suspect it wasn't worth the trouble. There's an excellent chance that I don't understand the physics at work regarding this, as all the other people seem to use insulated bands of metal around the whole stator. I got the idea for this coil from a message on Otherpower.com's discussion forum. It seems to work to some extent. It was much easier to make than the first one. With .8 ohms this coil produces about 5 volts. 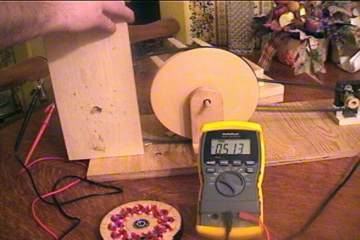 The first coil was 25 ohms and put out 11 or so volts at whatever speed my test rig is running at.... I suspect about 500 rpm, but I'll update that when I know for sure. This is pretty much an experiment still in progress. I haven't tested the amperage of my first two stators yet. Eventually I will get better magnets and try different coils. Also, as soon as someone can beat an understanding of 3 phase into my head I'll try to make one of those. 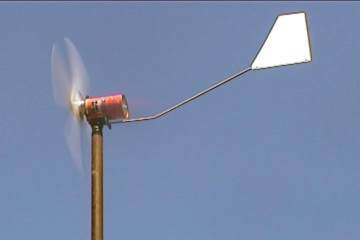 Inspired by the guys from Otherpower.com and Windstuffow.com, we want to be able to make a wind powered generator that can perform some useful function. These two were just fun experiments. We wanted to start small and learn what we could about the process before investing in a big project. 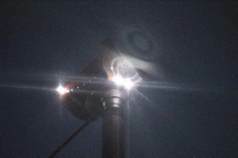 We have a much better understanding now of the issues surrounding wind powered generators. 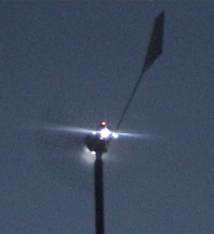 To balance average wind speed, prop size, generator characteristics and come up with a reliable system that produces usable power is definitely an art.